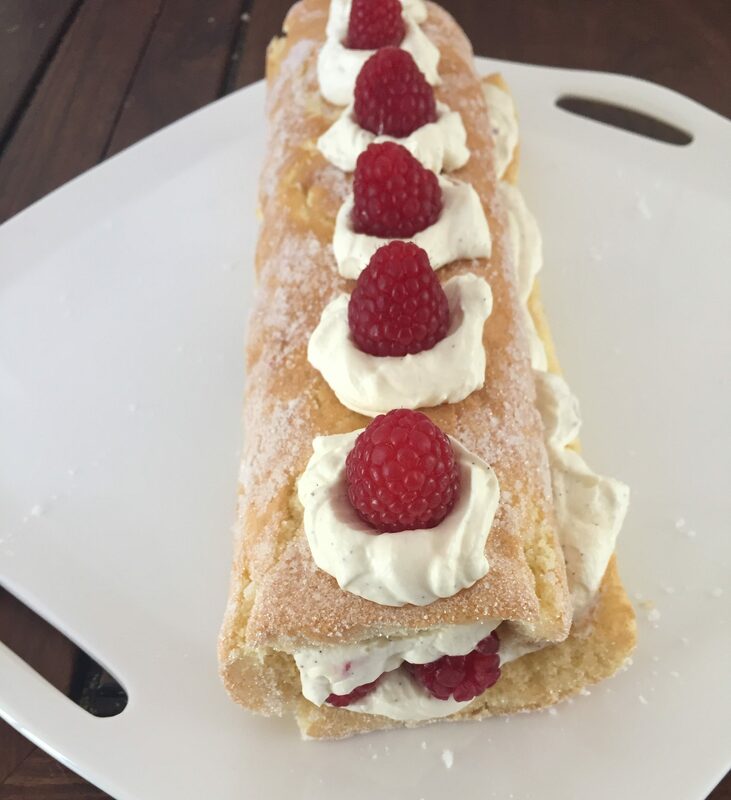 Until this year, I don’t think I’d made a Swiss roll since high school, when I did an baking course in Year 9 following on from the the general cooking class we all had to do (domestic science as it was then called). Despite making this one example in my teens, sponges in general have been one of my page turning recipe deal breakers, for no very good reason apart from the fact that people always talk as if they are more difficult and likely to fail than other cakes, and I hate recipes failing! But recently, due mostly to watching the Great British Bake Off, which the children and I are great fans of, I’ve been feeling a bit inspired, if intimidated, by the talk of Genoise, Yule Logs, Swiss buttercream, and French versus Italian meringue. My dad has also been inspiring me as he is a much more inventive and research minded baker than I am, and keen on recipes as ratios, so he tends to work out the basic ratios for a type of cake or dessert, and then come up with his own recipe. Well I decided to do the same…and what do you know, sponges really aren’t that hard (which my 14 year old self could probably have told me)! I looked at a few recipes, and while they disagreed a little about what type of flour to use, or whether to add baking powder or butter, they all agreed on the basic proportions – take the weight of the eggs in their shell, and add half as much of sugar and flour, it seems the rest is just tweaks! I decided to make it a bit more ‘dessert-ish’ by adding cream and raspberries as well as the jam, but if you’re using just jam you might want to roll from the short end to make a thicker spiral, as otherwise it will be skinnier than the roll pictured above. Preheat over to 180C. Line a Swiss roll tin (approx 30x22cm) with baking paper. Sift together the flours, baking powder and salt. Melt butter and leave to cool. Put eggs and sugar in the bowl of a stand mixer and whisk briefly to combine. Feel the bowl – if it feels at all cool, then leave eggs and sugar to come completely to room temperature, or stand the bowl for five minutes in a larger bowl of warm water. Once eggs are lukewarm, begin beating, gradually increasing speed to maximum. Beat for about five minutes until tripled in volume, very pale, and thick enough that the beaters leave a trail when you lift them. Sift dry ingredients (again) over the eggs, and carefully fold in with a large spatula or spoon. Pour the butter down the side of the bowl, and fold in gently as well to keep as much of the volume as possible. Pour the batter into the tin and gently spread to the corners, tapping the tin a couple of times to level. Bake for 10-12 minutes until golden and just springing back when you press on the top. While the cake bakes, lay out another sheet of baking paper and sprinkle with a couple of spoonfuls of caster sugar. When the cake is done, leave for two minutes, then turn out onto the sugared paper and gently roll up from the long side, rolling the sugared paper inside the cake. Cover with a cloth and leave to cool. When ready to serve, whip the cream and vanilla until thick. 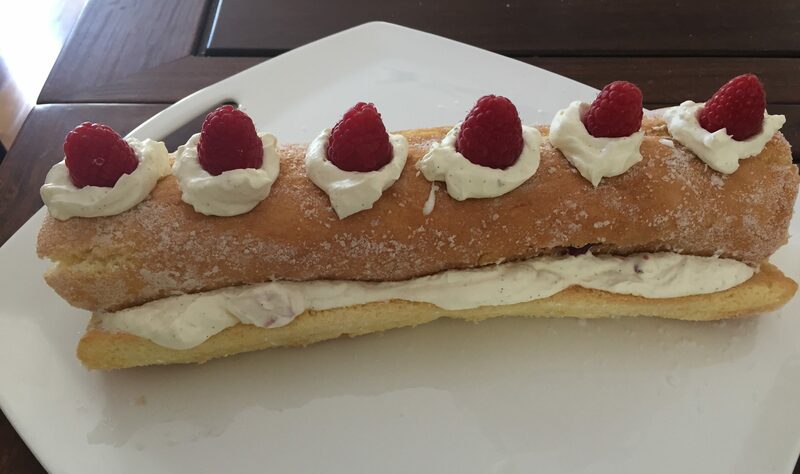 Unroll the cake (don’t worry if it cracks, the cream will hold it together), spread with jam, then most of the whipped cream, and top with raspberries, tearing bigger ones in half and reserving a few for decoration. 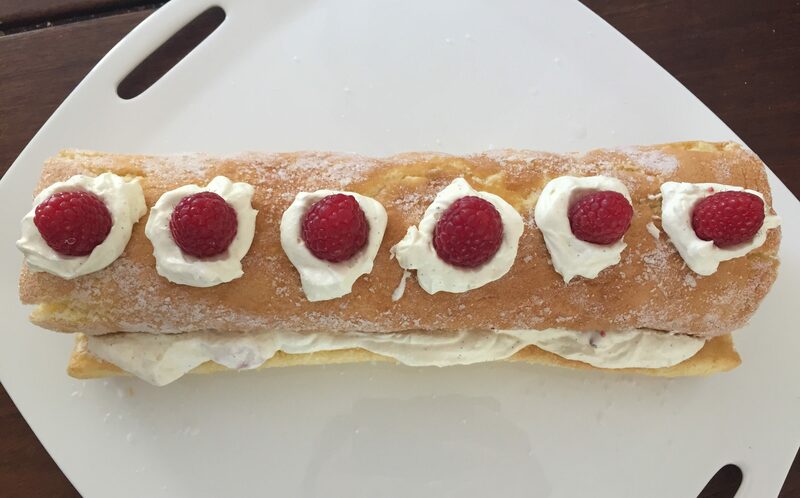 Carefully re-roll and place seam side down on a serving plate, topping with the remaining cream and raspberries. Cut in thick slices to serve. Gorgeous recipe and story, Beck! Raspberries – jam and fresh AND heavy cream! There is no other combo quite like it. I had to chuckle, though… Did you forget to take out the paper when you unrolled the sponge?